The core content of the Community Wind Toolbox comes from The Community Wind Handbook, developed by Windustry on behalf of the Rural Minnesota Energy Board and published December 15, 2006 by a partnership of the Agriculture Utilization Research Institute, the Southwest Initiative Foundation, The Minnesota Project, Clean Energy Resource Teams, and the Minnesota Corn Research and Promotion Council. The Community Wind Handbook offers high-quality practical information for farmers and rural landowners looking to develop commercial-scale wind projects. The content of The Community Wind Handbook has been integrated with related content and interactive tools to create the Community Wind Toolbox, a robust on-line resource for community wind development that will be kept up-to-date with the rapidly changing wind energy landscape. The Community Wind Handbook was a Clean Energy Resource Team (CERT) Project with funding from the Environment and Natural Resources Trust Fund as recommended by the Minnesota Legislative Commission on Minnesota Resources. Development and ongoing enhancement of the Community Wind Toolbox is funded through a grant from the Archibald Bush Foundation. 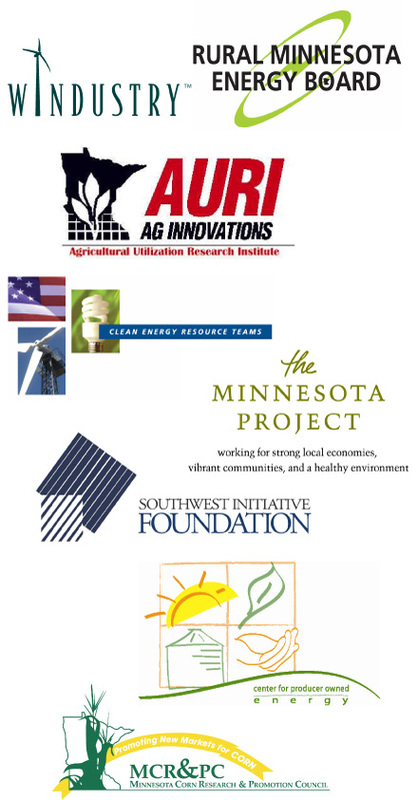 Major collaborators are Farmer’s Legal Action Group, Fredrikson & Byron P.A., eFormative Options LLC, and the Energy Foundation. We are fortunate and grateful for the community of professionals who worked with Windustry on this project, including Heather Rhoads-Weaver with her publishing skills, and Susan Reed with her layout design and artistic skills, as well as all of the individuals listed below that peer reviewed the various sections. “Community Wind: An Oregon Guidebook” prepared for the Energy Trust of Oregon by Northwest Sustainable Energy for Economic Development. “Community Wind Financing” written by Charles Kubert and published by the Environmental Law & Policy Center. “A Comparative Analysis of Community Wind Power Development Models” written by Mark Bolinger, Ryan Wiser, Tom Wind, Dan Juhl, Robert Grace, and Peter West and published by the Lawrence Berkeley National Laboratory. “Harvest the Wind: A Wind Energy Handbook for Illinois” prepared by Lisa Daniels, Sarah Johnson, and Wes Slaymaker at Windustry for the Illinois Institute for Rural Affairs at Western Illinois University. “Community Resources for Wind Development: Wind Energy Toolkit” compiled by New York State Energy Research and Development Authority. Christina Brusven, Fredrikson & Byron, P.A. Copyright © 2008 Windustry. All rights reserved. Individuals are permitted to download and print the Community Wind Toolbox for personal use. No distribution or commercial use of the Community Wind Toolbox in any format is permitted.